If this is an emergency please dial 604.639.0990 immediately. If you have any questions at all please contact us, we are happy to help. Typically older buildings have older piping and sewage lines, therefore wear and tear on these pipes make them more susceptible to incidents such as pipes breaks and leaks. During the winter time when temperatures drop, pipes can freeze up and burst causing water to escape. Other issues may result from the human error component for example, you want to mount your new flat screen TV on the wall, you start to drill the bracket into the wall but accidentally drill into a water pipe. Shut off your main water line. – Call a plumber! or call us to handle it, and call a plumber on your behalf. Avoid the possibility of electric shock. Do not use any vacuum to remove the water. Let the experts handle it. Avoid turning on fans or heating and air conditioning units as they may spread contamination if the situation is sewage-related. Our technicians will arrive on site within the hour and use professional water extraction equipment to remove any freestanding water. Water is extracted from carpet, padding and upholstery. Professional grade drying and dehumidifying equipment is used to dry the affected areas and return the humidity levels in your home to normal. Proper extraction and drying techniques help minimize the possibility of secondary damage, potential microbial growth and reduces costs. Special water detection tools are used to discover hidden pockets of water. Our water damage restoration technicians will monitor the drying process daily, repositioning drying equipment as needed. Once the property is dry, we schedule a the reconstruction of your home. We work directly with you and your insurance agent to process the claim. For over 20 years, Incredible’s Project Managers have build long standing relationships with most insurance companies’ adjusters. We are a recognized premium restoration service provider assuring a speedy reconstruction of your home. 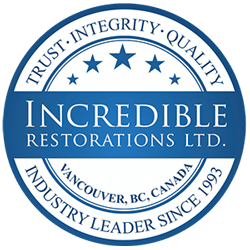 All Incredible Restorations’ water technicians have Institute of Inspection Cleaning and Restoration Certification (IICRC), the most widely recognized and accepted certification program in the industry. Our technicians are highly trained and prepared for any type of emergency water removal.